Apex is now proudly offering our full luxury limousine and sedan transportation services to and from Contra Costa County’s largest city – Concord. With a population of over 120,000 people this mid size city is emerging as the epicenter of both commerce and dining in Contra Costa County. Concord’s central location, easy BART accessibility and vibrant downtown area make it a premier destination in the metropolitan Bay Area. A myriad of bars and restaurants accentuate the burgeoning nightlife of downtown Concord. Centrally located Todos Santos Plaza regularly hosts free concerts and other cultural events making it a perfect place to visit during a night out on the town. While Concord’s up and coming night life should not be understated, there are also many memorable day time destinations to choose from. A large network of parks and trails are a natural addition to this larger East Bay city, complimenting the majestic beauty of the surrounding foothills and close by Mt. Diablo. 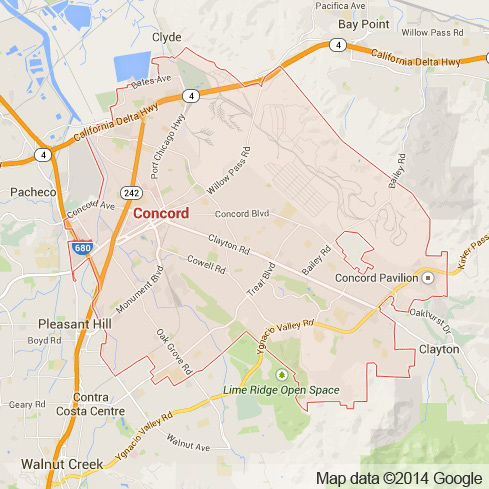 Concord is also home to one of the Bay Area’s most popular concert venues. The Concord Pavillion nestled within the rolling East Bay foothills, consistently hosts world class musical acts of all genres. From the hottest radio artists to your favorite childhood group, the Concord Pavillion hosts incredible concerts from all different musical genres. If you thought that wasn’t enough as far entertainment is concerned, Concord is also home to Six Flags Waterworld – a theme park with an elaborate network of water slides perfect for a Summer adventure. Concord really is the East Bay’s up and coming entertainment destination. Apex limousine and sedan transportation is very pleased to offer residents and visitors of Concord a full range of luxury limo transportation services for any occasion. For Bay Area residents looking to turn their Concord Pavillion concert experience into something a little more special will be pleased by our diverse and luxurious fleet of sedans, SUVs and limousines to choose from. Arriving to see one of your favorite musicians in a limousine is the epitome of a great time. We also are proud to offer residents and visitors of Concord alike a plethora of other limousine and sedan transportation services that include but are not limited to: comprehensive weddings services, Senior Ball and Junior Prom, SFO/OAK/SJC airport pick ups and drop offs, as well as Napa Valley Wine Tours. Apex stands out among other luxury limousine transportation services due to our reliability and professionalism. We are consistently a favorite among the business people in need of a timely airport pick up, the parents whose children are attending their first prom and the old friends who want an incredible limo weekend getaway in the Napa Valley. So please join us so we can make your dreams come true. Please call us for car service all inclusive total for Concord to/from Napa Valley transfer.